FEP Heatcare Ltd first came to the attention of the ICO in February 2015 when it appeared in the top 20 most complained about nuisance call companies compiled by the Telephone Preference Service (TPS). Despite a warning from the ICO that it must operate within the rules or face action, FEP Heatcare deliberately broke the rules again, this time making marketing calls playing a recorded message. Calls that play a recorded messages are covered by the Privacy Electronic Communications Regulations (PECR) and can only be made to people who have given the organisation their permission to receive this type of call. FEP Heatcare admitted it did not have that consent. The ICO found that FEP instigated 2,692,217 automated calls between April 2015 and July 2015. 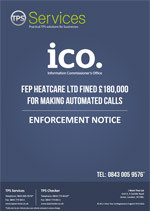 The ICO has also issued a “stop” notice to FEP Heatcare to ensure it does not make any further nuisance automated marketing calls. If it does not comply with the notice, the company could face court action.